Astronaut Peggy Whitson is pictured during her eighth spacewalk which took place March 30, 2017. The 200th spacewalk aboard the International Space Station began this morning at 9:08 a.m. EDT for a spacewalk planned to last about four hours. Managers in mission control decided to shorten the spacewalk from the original six and a half hour plan, due to available battery power for the spacesuits. During earlier spacewalk preparations, Whitson and Fischer shared a service and cooling umbilical (SCU) after a small water leak was detected in a second SCU that was connected the Fischer’s suit. This was not a leak in Fischer’s suit. The SCU is an airlock component used to provide electricity, cooling and communications to the crew while performing their pre-breathe activities in the Equipment Lock. 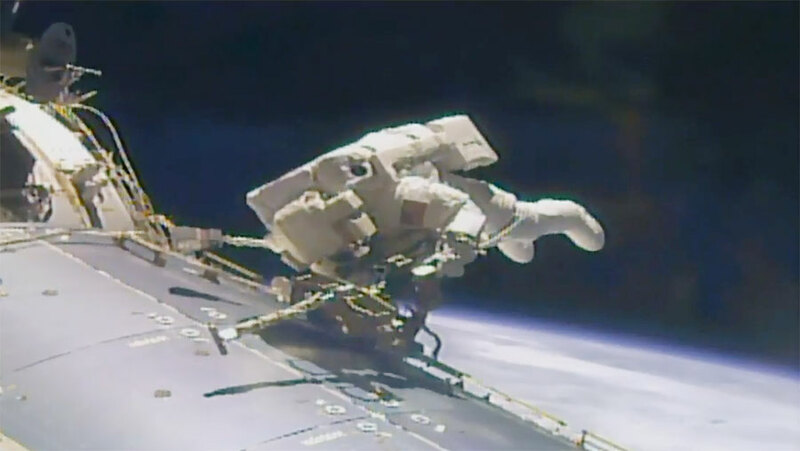 The sharing of the SCU resulted in additional draw in battery power from the suits during preparations while in the Equipment Lock, reducing the battery power available for use during the spacewalk. During the abbreviated spacewalk, Expedition 51 Commander Peggy Whitson and Flight Engineer Jack Fischer of NASA will tackle the principle objective to replace a large avionics box that supplies electricity and data connections to the science experiments, and replacement hardware stored outside the station. The ExPRESS Carrier Avionics, or ExPCA is located on the starboard 3 truss of the station on one of the depots housing critical spare parts. Whitson is wearing the suit with red stripes as extravehicular crew member 1 (EV 1). Fischer, extravehicular crew member 2 (EV 2), is wearing the suit with no stripes. This space selfie was taken during the last spacewalk on March 30 with astronauts Peggy Whitson and Shane Kimbrough. 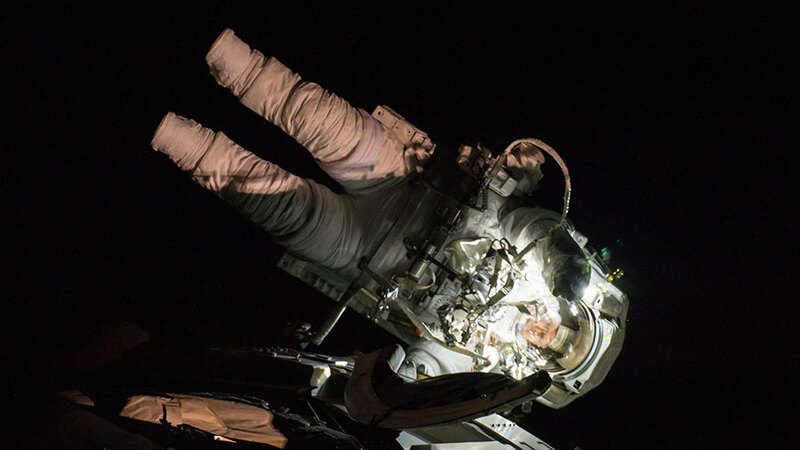 Expedition 51 Commander Peggy Whitson and Flight Engineer Jack Fischer of NASA will venture outside the International Space Station for a six-and-a-half hour spacewalk Friday, May 12. The spacewalk will begin at about 8 a.m. EDT, with complete coverage on NASA Television and the agency’s website starting at 6:30 a.m.
Whitson and Fischer will replace a large avionics box that supplies electricity and data connections to the science experiments, and replacement hardware stored outside the station. The ExPRESS Carrier Avionics, or ExPCA is located on the starboard 3 truss of the station on one of the depots housing critical spare parts. It will be replaced with a unit delivered to the station last month aboard the Orbital ATK Cygnus cargo spacecraft. This will be the 200th spacewalk in support of space station assembly and maintenance. 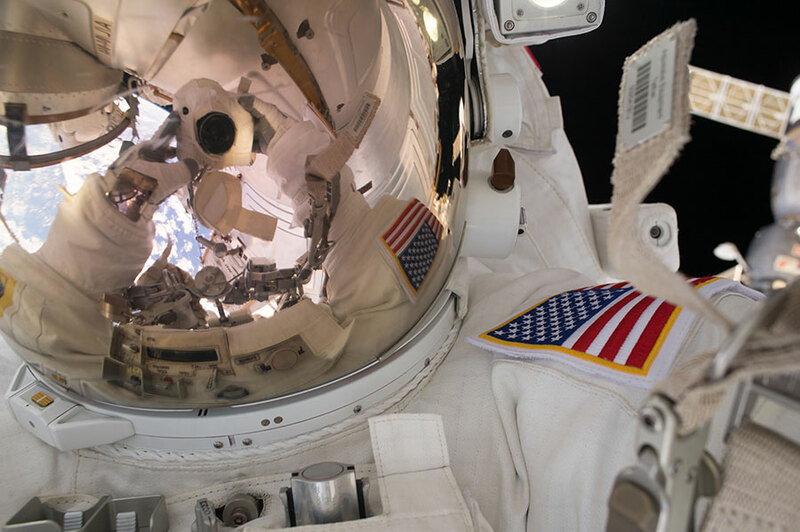 Whitson, who already holds the U.S. record for most spacewalks by a female astronaut, will make this ninth excursion as extravehicular crew member 1, wearing the suit with red stripes. Fischer, extravehicular crew member 2, will wear the suit with no stripes on his first-ever spacewalk. Astronaut Jack Fischer is pictured wearing a U.S. spacesuit during a fit check in preparation for his first spacewalk. Commander Peggy Whitson will work outside the space station for the ninth time in her career on Friday. She will be joined by Flight Engineer Jack Fischer who will embark on his first spacewalk. The duo will exit the Quest airlock around 8 a.m. EDT for about 6.5 hours of external tasks. They will replace an avionics box that provides power to science experiments, install a shield on the Pressurized Mating Adapter-3 and rig a new high-definition camera and pair of wireless antennas. 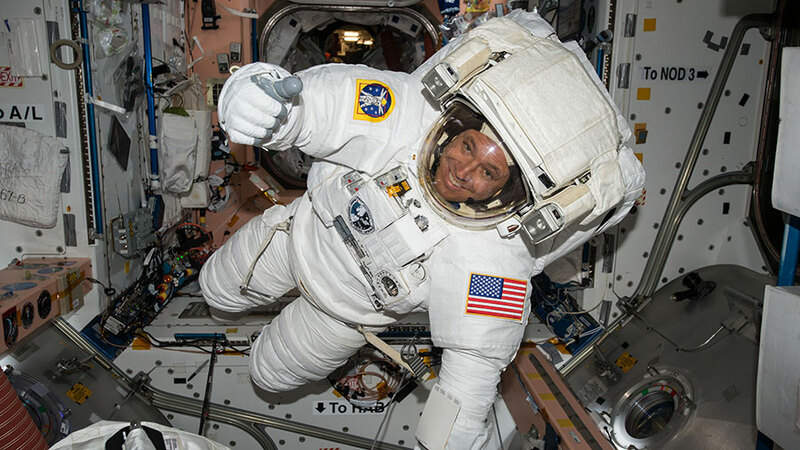 NASA TV will broadcast live the 200th spacewalk at the station for assembly and maintenance starting at 6:30 a.m.
Whitson is also in the second week of a study that explores the differences in bone structure on Earth and in space. She swapped bone cell media inside the Microgravity Science Glovebox which is then stowed inside a science freezer. The experiment samples will be returned to Earth on a future SpaceX Dragon mission for analysis by scientists. Astronaut Jack Fischer works inside the cupola with the Soyuz and Cygnus spaceships right outside the windows. The Expedition 51 crew is getting ready for a spacewalk Friday and working on several scientific investigations. Robotics controllers also swapped out a power relay box over the weekend through a complex and innovative robotic procedure. Astronauts Peggy Whitson and Jack Fischer will exit the International Space Station for a 6.5-hour spacewalk on Friday. The duo will replace an avionics box that routes command and data information to external science experiments. Friday’s spacewalk will be the 200th at the station for assembly and maintenance, the ninth for Whitson and the first for Fischer. Whitson continued more research today comparing how bones adapt to space versus on Earth. Fischer stowed leaves that were harvested for the Veg-03 botany study and stowed them in a science freezer. Friday evening and into Saturday, Robotics Ground Controllers maneuvered the Special Purpose Dexterous Manipulator (SPDM) Arms and successfully removed a failed Main Bus Switching Unit-2 and replaced it with a spare. The MBSU in question had stopped communicating telemetry back on April 25 but was still routing power to station systems. The crew had installed a series of jumpers to power systems connected to the MBSU during the replacement, ensuring no impact to continued station operations. This was the first time an MBSU was swapped out by means other than a spacewalk. Since the successful replacement, the MBSU was powered up and checked out successfully with all station systems back to nominal power configuration. 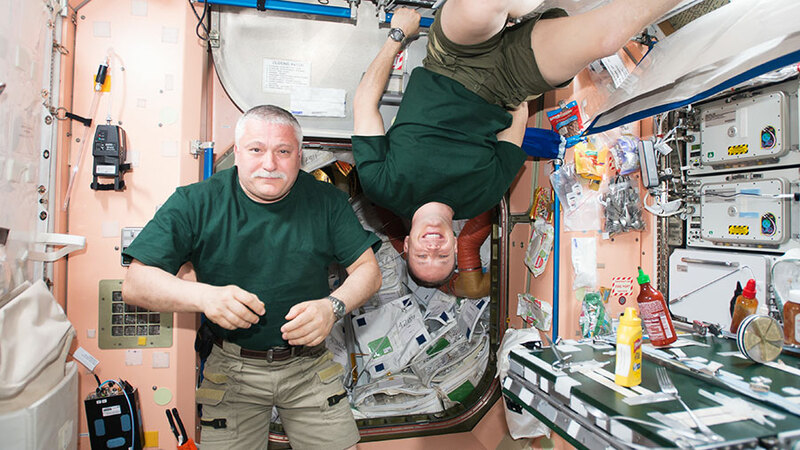 Expedition 15 crew members Fyodor Yurchikhin and Jack Fischer take a break during mealtime in the Unity module. The five-member crew aboard the International Space Station was back at work Thursday researching how living in space affects the human body. Two of today’s experiments looked at how microgravity weakens bones and alters DNA. Commander Peggy Whitson joined Flight Engineer Thomas Pesquet for the OsteoOmics bone loss study. The experiment compares bone loss in the free-floating environment of microgravity versus magnetic levitation on Earth and observes the molecular changes that place. Results may improve the health of crews in space and humans on Earth, possibly counteracting bone loss and preventing bone diseases. Pesquet later checked samples for the Genes In Space experiment that is based on a winning proposal submitted during a student science competition. That study is testing new technology to track how a space mission alters an astronaut’s DNA and impacts their immune system. The rest of the crew, including NASA astronaut Jack Fischer and cosmonauts Fyodor Yurchikhin and Oleg Novitskiy, split their time between loading a Russian cargo craft, crew orientation and systems maintenance. The Expedition 51 crew poses for a portrait with the captured Cygnus resupply ship just outside the cupola. In the foreground is Flight Engineer Fyodor Yurchikhin. In the background from left, are Commander Peggy Whitson and Flight Engineers Jack Fischer, Thomas Pesquet and Oleg Novitskiy. The Expedition 51 quintet studied how long-term space missions affect bone loss and explored new ways to exercise in space today. The crew also reviewed emergency procedures and equipment onboard the International Space Station. Astronauts Peggy Whitson and Thomas Pesquet set up samples today for the OsteoOmics bone study that will last four weeks on the station. Doctors are researching the molecular mechanisms that impact the bones of astronauts living in space. The experiment could lead to therapeutic insights improving the health of astronauts in space and humans on Earth. New Flight Engineer Jack Fischer performed an ultrasound scan of his leg muscles with assistance from Whitson and remote guidance from ground personnel. The ultrasound data is being collected for the Sprint study that is exploring the benefits of high-intensity, low-volume exercise to maintain muscle, bone and heart functions. Whitson and Fischer then joined veteran cosmonaut Fyodor Yurchikhin for a couple of hours of emergency training. The trio took note of safety gear locations, followed escape paths to the docked Soyuz vehicles and inspected hatches for proper clearances. 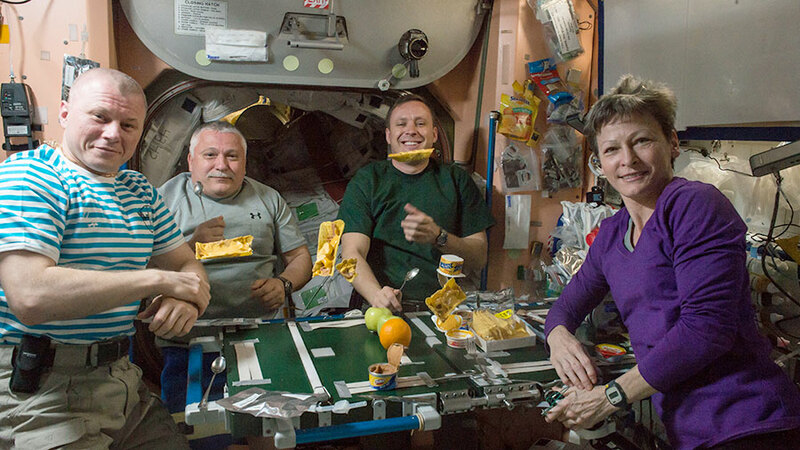 Expedition 51 crew members share a meal inside the Unity module. From left are Flight Engineers Oleg Novitskiy, Fyodor Yurchikhin and Jack Fischer and Commander Peggy Whitson. The International Space Station raised its orbit today to get ready for a June crew departure. The first of two orbital reboosts comes just a week after two new crew members arrived to begin their mission with Expedition 51. Flight Engineers Oleg Novitskiy and Thomas Pesquet will return to Earth June 2 ending the Expedition 51 mission. Expedition 52 will begin and veteran cosmonaut Fyodor Yurchikhin will stay behind with NASA astronauts Peggy Whitson and Jack Fischer waiting for the next crew arrival on July 28. The current orbiting crew of five Expedition 51 crew members continued more biomedical research and eye checks today. 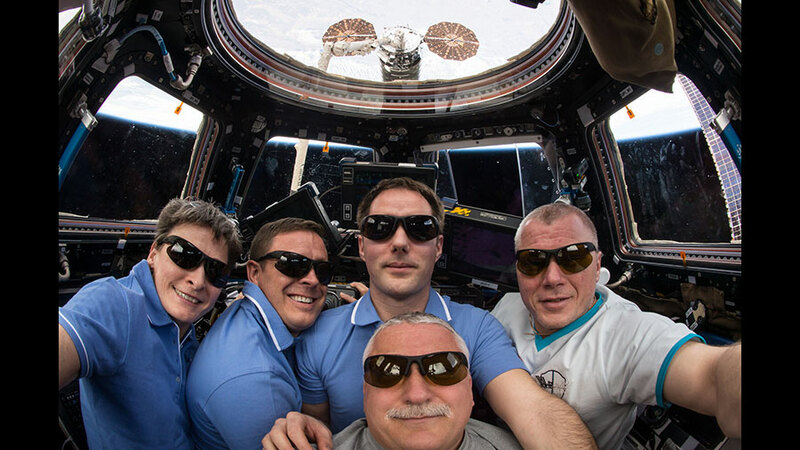 The crew underwent a series of ultrasound scans and eye tests to learn how living in space affects vision. The astronauts are subjects of ongoing studies to help NASA plan missions farther out in space for longer periods of time. One symptom of living in space for long periods is the pressure that builds up behind astronauts’ eyes due to the upward flow of fluids. Doctors are seeking to counteract this flow after some astronauts have reported vision problems during and after their long-term missions. 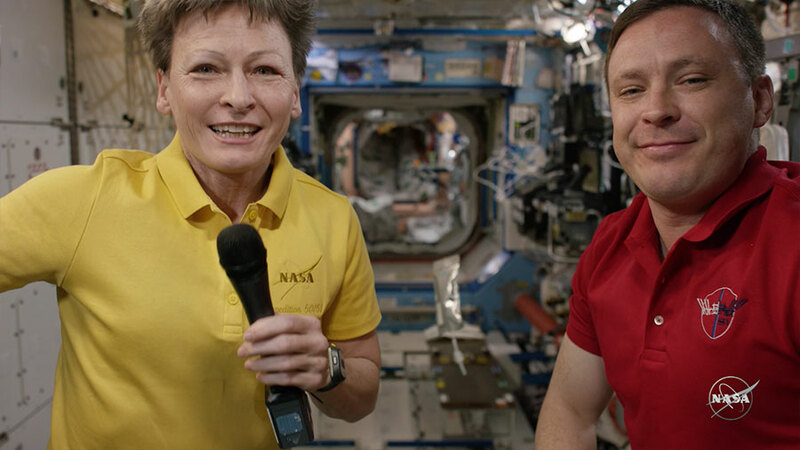 NASA astronauts Peggy Whitson and Jack Fischer talk live to panelists at the National Association of Broadcasters using 4K ultra-high-defintion streaming technology for the first time. NASA astronauts Peggy Whitson and Jack Fischer live-streamed a broadcast from space today using 4K ultra-high-definition technology for the first time. The duo called down to the National Association of Broadcasters in Las Vegas to demonstrate the advanced technology and promote space science and filmmaking. Expedition 51 worked throughout Wednesday on a variety of microgravity research and spaceship unpacking. The five crew members also conducted vision checks while their newest pair continued getting up to speed on International Space Station systems. French astronaut Pesquet joined Russian cosmonaut Oleg Novitskiy for ultrasound scans and eye exams in the morning. The two crewmates are participating in a study to understand and offset the headward fluid shifts in space that are known to affect vision. Pesquet got together at the end of the day with Whitson and Jack Fischer for more eye checks with guidance from doctors on the ground. Whitson also studied how astronauts adapt to touchscreen interfaces. Fischer spent a few hours swapping sample cartridges in a high-temperature furnace lab facility. Veteran cosmonaut Fyodor Yurchikhin continued offloading cargo from the new Soyuz MS-04 crew ship. Pesquet also transferred new science and crew supplies from the Cygnus resupply ship. Yurchikhin and Fischer are continuing to adapt to living and working aboard the station having been in space less than week. Expedition 51 Commander Peggy Whitson broke the U.S. record today for most cumulative time living in space, surpassing astronaut Jeff Williams’ record of 534 days set during his four spaceflights. She passed Williams’ mark at 1:27 a.m. EDT. 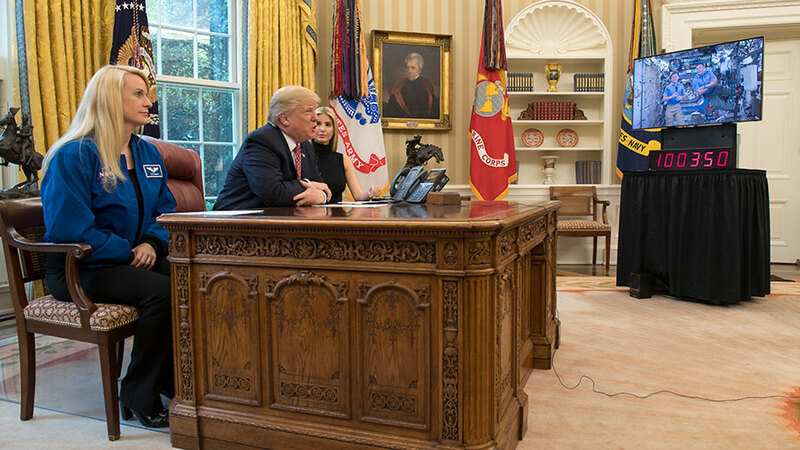 President Donald Trump called the International Space Station Monday morning and congratulated Whitson on her record-breaking career. Whitson and her newest crewmate NASA astronaut Jack Fischer discussed NASA’s research in space and its plans to go to Mars in the 2030’s. Before today’s presidential call the Expedition 51 crew members joined together to review their roles and responsibilities in the unlikely event of an emergency aboard the International Space Station. If necessary, they could put on safety gear, evacuate the station into their docked Soyuz vehicles and quickly undock for a ride back to Earth. The crew is also unloading gear today from two new spaceships that arrived last week. Veteran cosmonaut Fyodor Yurchikhin has been transferring cargo from the Soyuz MS-04 spacecraft he piloted to a docking last Thursday. 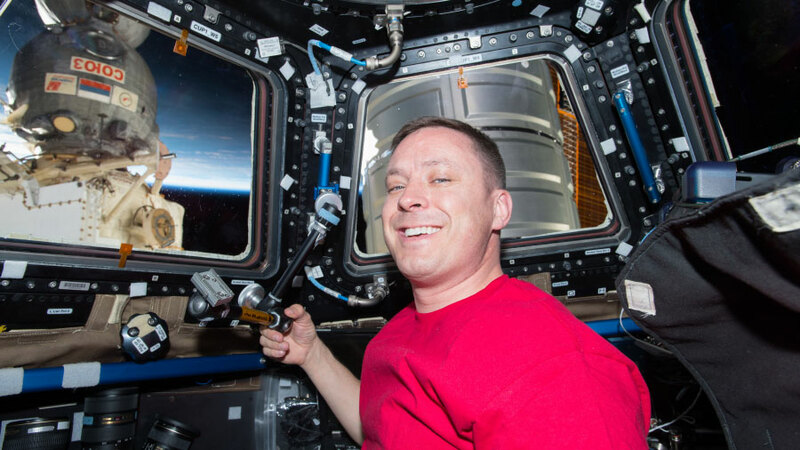 Whitson and Flight Engineer Thomas Pesquet are working to offload new science experiments and crew supplies that arrived Saturday morning aboard the Cygnus resupply ship.